With Azure services and Power BI, you can turn your data processing efforts into analytics and reports that provide real-time insights into your business. Whether your data processing is cloud-based or on-premises, straightforward, or complex, single-sourced or massively scaled, warehoused, or real-time, Azure and Power BI have the built-in connectivity and integration to bring your business intelligence efforts to life. You can start with a straightforward connection to an Azure SQL Database, and create reports to monitor the progress of your business. Using the Power BI Desktop, you can create reports that identify trends and key performance indicators that move your business forward. There's plenty more information for you to learn about Azure SQL Database. Do you have more complex data, and all sorts of sources? No problem. With Power BI Desktop and Azure services, connections are just a tap of the Get Data dialog away. Within the same Query you can connect to your Azure SQL Database, your Azure HDInsight data source, and your Azure Blob Storage (or Azure Table Storage), then select only the subsets within each that you need, and refine it from there. You can create different reports for different audiences too, using the same data connections and even the same Query. Just build a new report page, refine your visualizations for each audience, and watch it keep the business in the know. You can expand as much as you need with Azure and Power BI. Harness multi-source data processing, make use of massive real-time systems, use Stream Analyticsand Event Hubs, and coalesce your varied SaaS services into business intelligence reports that give your business an edge. Embed stunning, interactive data visualizations in applications, websites, portals, and more, to take advantage of your business data. With Power BI Embedded as a resource in Azure, you can easily embed interactive reports and dashboards, so your users can enjoy consistent, high-fidelity experiences across devices. Power BI used with embedding analytics is to help you through your journey from Data -> Knowledge -> Insights -> Actions. Furthermore, you can extend the value of Power BI and Azure also by embedding analytics in your organization's internal applications and portals. There's lots of information about Power BI APIs in the Power BI Developer Portal. 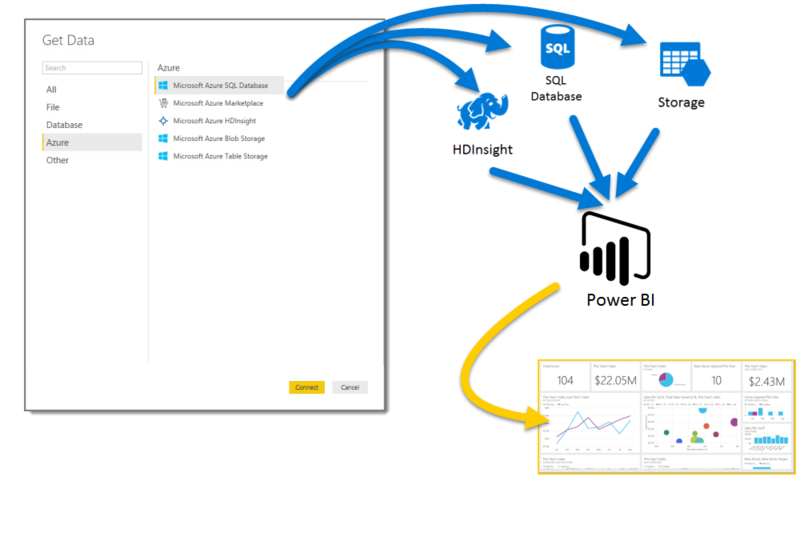 For more information, see What can developers do with Power BI?. Embed stunning, interactive data visualizations in applications, websites, portals, and more, to showcase your business data in context. Using Power BI Embedded in Azure, you can easily embed interactive reports and dashboards, so your users can enjoy consistent, high-fidelity experiences across devices. 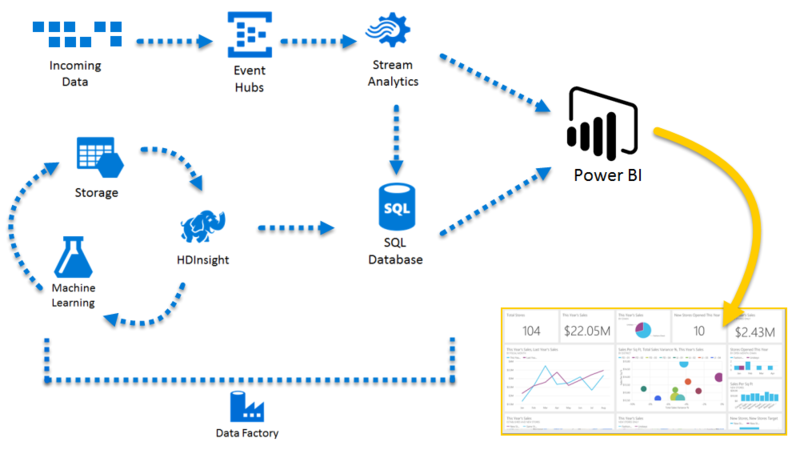 What could you do with Azure and Power BI? There are all sorts of scenarios where Azure and Power BI can be combined - the possibilities and opportunities are as unique as your business. For more information about Azure services, check out this overview page, which describes Data Analytics Scenarios using Azure, and learn how to transform your data sources into intelligence that drives your business ahead.